Preschool gross motor activities should be an important part of your child's routine, as they help build the foundation skills needed for learning. Many parents think that having good gross motor skills can enable a child to excel at sports. This is only part of the benefit! Developing your child's gross motor skills can do so much more than that – they can influence a child’s ability to write well, to read well and even to concentrate in the classroom. 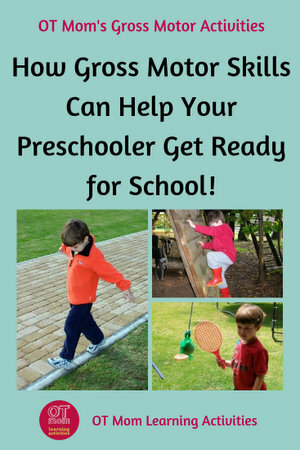 Let's take a look at some of the skills your child will need in formal school, and see how including preschool gross motor activities can develop this skill! Taking part in gross motor activities can help your child develop the physical endurance needed to sit at a desk for extended periods of time. 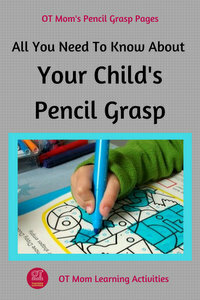 This may also help your child's ability to concentrate. 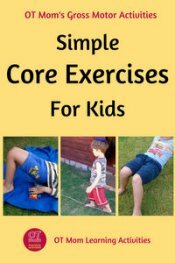 Activities that develop the core muscles can help your child to sit upright and not slouch at the desk or on the mat. Taking part in sports, games, and other preschool gross motor activities, with or without other children, can help your child to learn to listen and to follow instructions. These are vital skills for any child to have in the classroom. 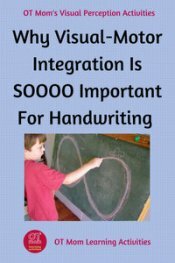 Copying work from the blackboard requires your child to visually focus on the work on the board, and transfer focus from near to far and back again. These functional visual skills are often enhanced by participation in gross motor activities, especially ball games. In order to use the small muscles of the hands to hold a pencil or manipulate scissors, the large muscles of the arms, shoulder and trunk need to be strong and stable. 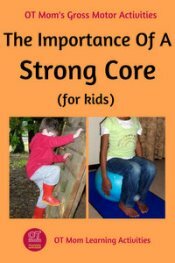 Gross motor activities that target the core muscles and the shoulder muscles can help develop this strength and stability. 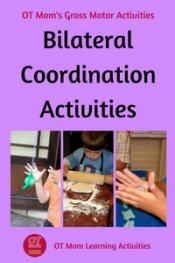 Doing gross motor tasks that involve coordination may also help your child to coordinate the hands to use scissors and other stationery well. 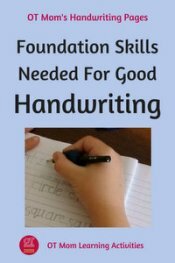 In order to master handwriting, your child needs to be able to use the hands and eyes well together, a skill called visual-motor integration.This means that the eyes guide the hands in controlling the pencil so that the correct shapes and lines can be made to create the letters. 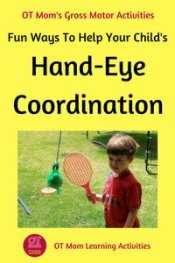 Developing eye-hand coordination through gross motor games can help your child master visual-motor integration. 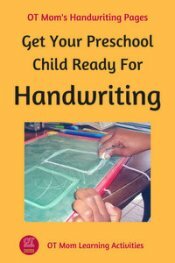 In order for your child to correctly space out the written work on the page, crossing the midline and directionality skills need to be well established, as well as spatial perception and planning skills. Giving your preschool child lots of gross motor opportunities can help your child develop these skills while moving around, changing direction, and planning how to use equipment. Playing at the park can work on all these areas! 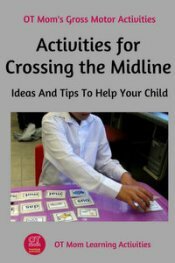 You can also try my ideas for including midline crossing in gross motor activities. 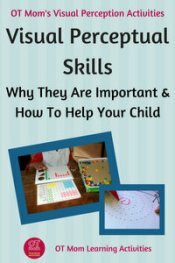 Your child needs good visual tracking and focusing skills in order to read well. 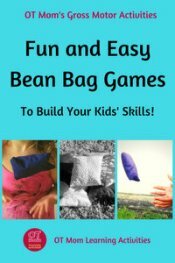 Ball games, bean bag games and games requiring eye-hand coordination can help these skills to develop. Many preschool gross motor activities involve rhythmical counting, which can help your child internalize number sequences. Encourage your child to count jumps and throws, or assign them a certain number to do - it takes a lot of control to stop at jump number 10 on a trampoline! You can also include number recognition in games such as hopscotch and target tossing. Introduce skip counting in 2's and 10's as your child gets older. Although many of the activities on my site are geared to children in kindergarten and first grade, most of them can easily be used by preschoolers as they develop their skills. 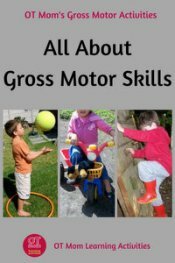 Check out these gross motor activity pages for some fun ideas! 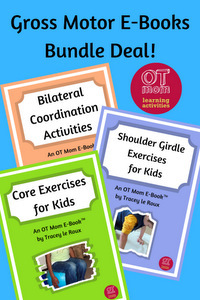 Or check out these gross motor posts by fellow therapists! Dinosaur Physical Therapy has an article on teaching children how to jump. Passport to Function has some ideas for fun gross motor activities with swings. 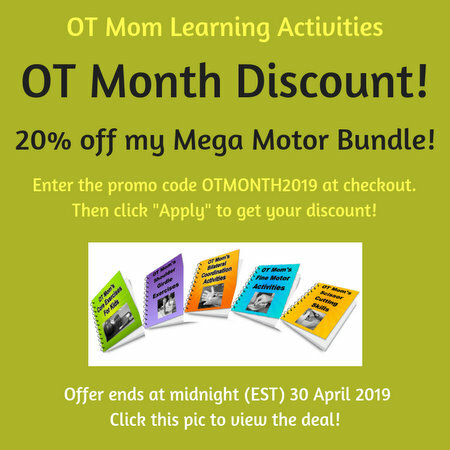 Mama OT shows how she sneaks fine motor activities into an obstacle course. She uses therapy equipment, but you can make your own set of obstacles with whatever you have at home. Your Kids OT has a great idea for a color shape path - let your preschooler cut out the shapes and then use the path for a variety of gross motor activities! I hope you found this page helpful and inspiring! Why not sign up for my free, occasional newsletter to stay in touch with new and updated pages on my site?